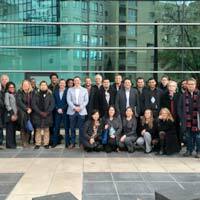 The director of the DBA in Geneva, Fernando Lagrana, welcomed the newest DBA Swiss cohort on Monday, Nov. 23 at their first workshop in Grenoble, France. 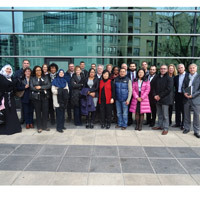 The program is a collaboration between Webster University Geneva and Grenoble Ecole de Management, which offers the DBA. This year’s cohort has 10 different nationalities among the 12 students, whose countries include Germany, India, Indonesia, United Arab Emirates, Italy, France, Switzerland, Bulgaria, Finland and the United States via Nigeria. Webster alumni in Geneva for their 25-year reunion mixed with current students during a weekend workshop for the DBA program, a collaboration with Grenoble Ecole de Management.